The new Windows-powered Nextbook tablets come in 10.1, 11.6, and 12.5 inch sizes featuring a removable magnetic keyboard, quad-core Intel Atom processors, as well as dual cameras and multiple connectivity options. E FUN is now the fifth largest tablet supplier in the US and will bring three Nextbook Windows tablets at CES 2015. These new models have the following screen sizes: 10.1, 11.6, and 12.5 inches. All will be shown at next week's event in South Hall meeting room MP25477. According to Jean Philippe Bouchard, research director, tablets at IDC, the 2-in-1 product category is expected to enjoy a solid growth this year. This will be mainly driven by lower priced convertibles that can fill a void in the market. "Consumers are interested in the 2-in-1 form factor, but early products were prohibitively expensive. E FUN is throwing open the category to more people, and that’s always a good thing," says Bouchard. According to the official press release, the 10.1-inch model comes with 1 TB of OneDrive cloud storage for one year, 60 Skype world minutes per month, as well as one-year subscription to Microsoft Office 365 Personal. These Windows slates will hit the market in May for $229, $249, and $279 USD (MSRPs for 10.1-inch, 11.6-inch, and 12.5-inch models). WEST COVINA, CA – January 2, 2015 – E FUN, the fifth largest tablet supplier in the U.S.*, is expanding its line of 2-in-1 Nextbook tablets running Windows 8.1 with three new models at CES 2015. The new 10.1”, 11.6” and 12.5” models feature a removable magnetic POGO keyboard,Quad-Core Intel® AtomTM processor, dual cameras, and a multitude of ports and connectivity options. 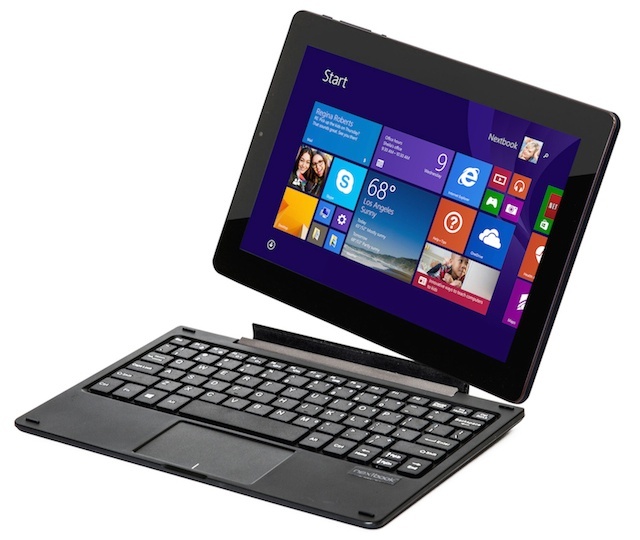 The 2015 new line of Nextbook 2-in-1 tablets will be on display at the International CES in South Hall meeting room MP25477. The E FUN Nextbook 2-in-1 tablets with Windows will be available in May 2015 with MSRPs of $229 (10.1”), $249 (11.6”), and $279 (12.5”).